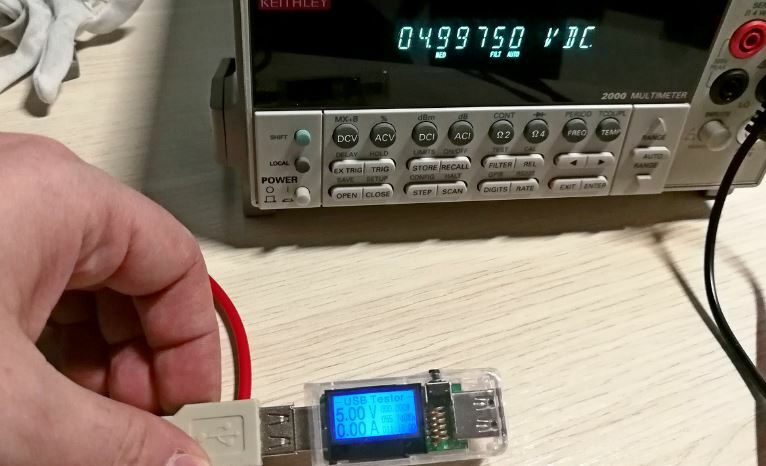 Usb tester or so called charger doctor allows to measure the power bank’s capacity,analyze the charging process of smartphones and other gadgets, measure the necessary amount of energy needed to fully charge and consider Quick Charge operation. 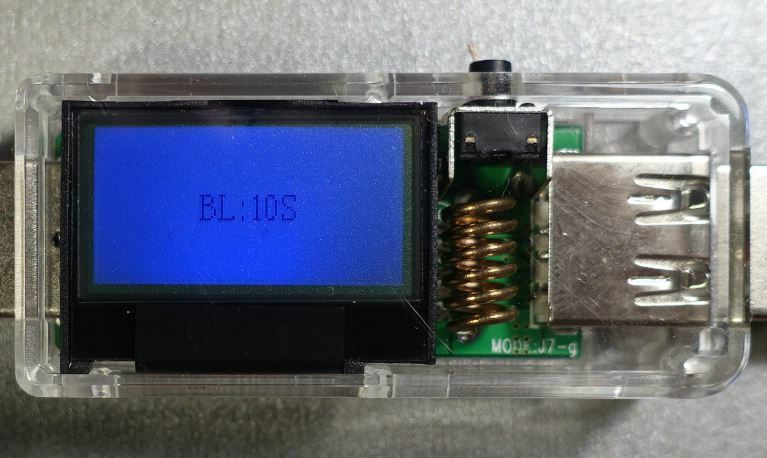 The LCD screen, 23×12.5 mm in size, has three modes of displaying information, switched by a button. The voltage and current are displayed in large numbers in the first mode, the power, energy and time are shown in small numbers. The time is counted as long as the load power exceeds 0.5 W (5V voltage equals to 100 mA current). Energy (Wh), charge (mAh) and time values are retained in the memory even after the tester is turned off. 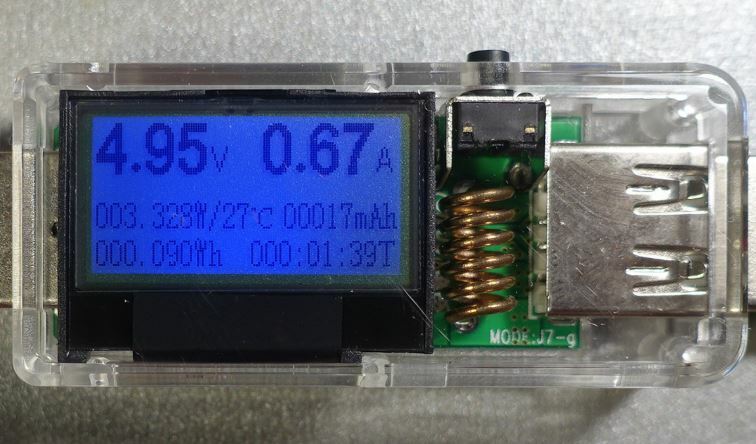 The voltage and current are displayed in large numbers in the top line of the second mode, the power and the temperature are shown in small numbers, the charge (mAh), energy (Wh) and time- inside the tester. In the third mode, the voltages on the pins of the USB input connector are displayed on the left, the load resistance, power, time, current and temperature are displayed on the right. 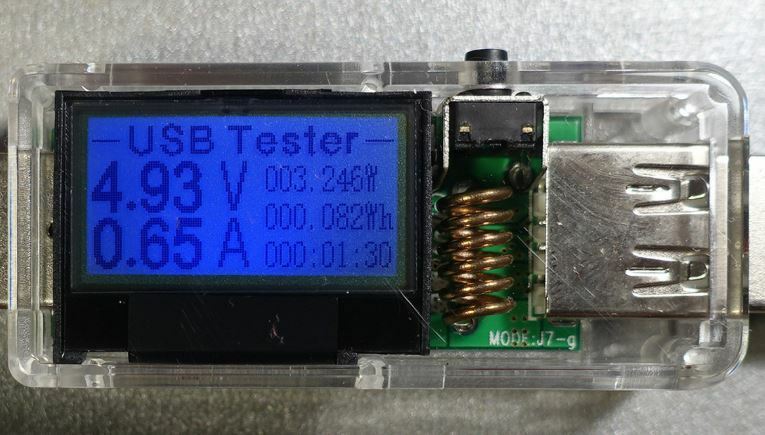 The tester has a screen backlight setting – it lights for 10 seconds by default. 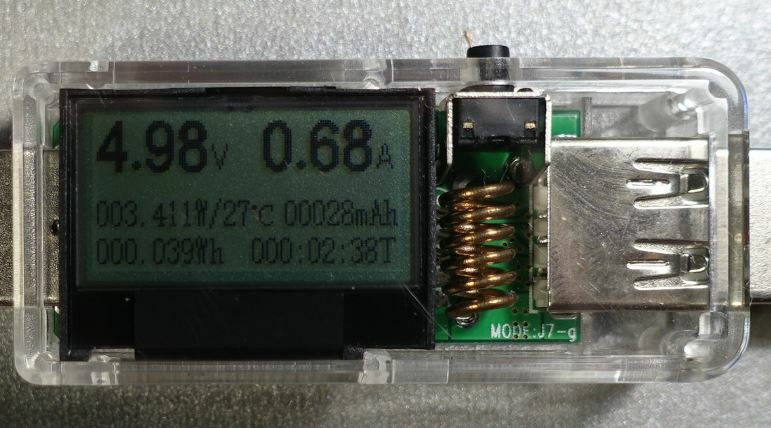 When the backlight goes out, it is hard to see the screen, but the tester consumes a record low current – 1.55 mA (the backlight consumption is also very low – 2.9 mA). The backlight time is adjustable from 1 to 59 seconds, besides, the backlight can be permanently turned off or on . 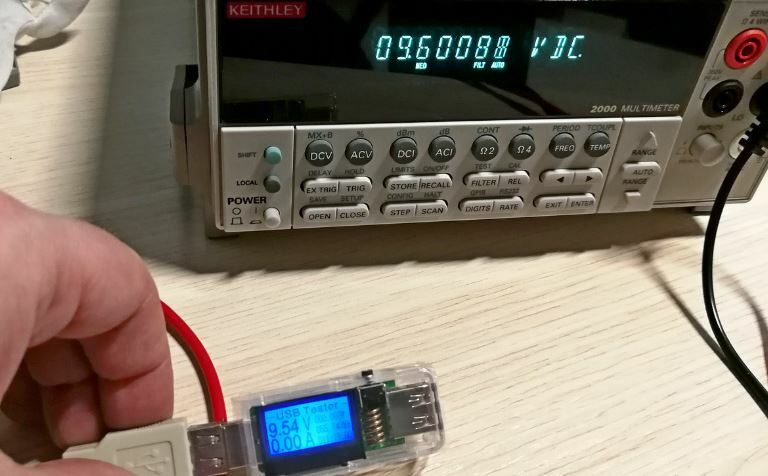 The accuracy of voltage and current measurements was verified using a reference voltage source Keithley 2000 Multimeter precision device.Everything is perfect at a 5V voltage. The tester is less accurate at higher voltages. 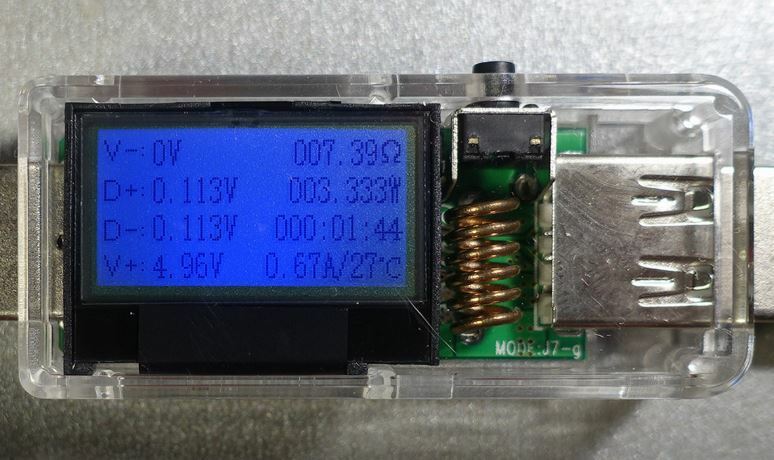 So, with a voltage of 9.6008 V, it shows 9.54 V – plus/minus 0,6% – measurement error of the instrument. The error of current measurement is about 2%: the device shows 0.51A at a current of 0.51908A – plus/minus 1.8%-measurement error. At the current of 1.0184A the instrument shows 1.00A. The error is the same 1.8%. • measurement of load resistance. • flux is not washed from the contacts of connectors.